Swedish Chef: GURPS GURPS GURPS! I pointed out that he’d basically just described the primary conceit of GURPS Banestorm, and that for the most part, GURPS was what he was looking for. Not only that, but if he’s looking for simplified play, if he can hold out until the summer or fall, the Dungeon Fantasy RPG may just do a lot of the clean up GURPS’ toolkit nature requires in order to get with the playing. Where does GURPS go right? Well, as one of the original point-buy systems it obviously is not only classless, but level-less as well. Each character will get a certain number of points to define and excel in their own niche, should they choose to have one. The DFRPG and the free-range 4e Dungeon Fantasy line will give him most of what he wants there, with a mildly stripped-down set of rules that is designed around the tropes he wants. Using this in the Banestorm setting will work just fine. The natural use of Tech Level will make easy hash out of anyone that wants to play A Connecticut Yankee in Megalan’s Court, with the reduced value of the skills transferring over into more of other things to buy, in all likelihood. But more on that in a moment. Monster support is always a sore spot, but it shouldn’t be. While there is no GURPS Monster Manual, there is plenty of support for GURPS monsters, both fan-made and official. Note to SJG: with the vast surplus of resources available (cough cough), taking the various monsters published from the different 4e books and collecting them in one place would make a monstrously good PDF, and maybe even POD. It’s editorial rather than authorial work, but it would show the level of support GURPS actually has for critters. Failing that, just buy GURPS Horror. And of course, the various Dungeon Fantasy Monsters books (1, 2, and 3) and Pyramid issues with DF-compatible monsters in them. Oh, and Monster Hunters has some epic bad-asses with with to threaten lower-point PCs. GURPS also meets the need for a relatively low number of stats: four. Still, that’s a bit deceiving, because while there are four main attributes, there are a reasonable number of derived attributes, and you can spend points on all of them. So that’s a mixed bag. Mirror of the Fire Demon and two small adventures in the most recent Pyramid issue (3/98 – oh, ) are where it’s at for recent adventure support, but you can go back into the vaults and find Orcslayer, which might be satisfying. Further, GURPS makes for relatively easy conversion from other systems. Got an adventure path you like? Play it, such as when Nate ran us through Jade Regent using GURPS Dungeon Fantasy. Finally, here’s half of the story on combat powers and spells. Most “combat powers” are what GURPS would term Advantages, and one does indeed pick them off a list. Same thing with the standard GURPS Magic system, though it is not without its detractors and not without its flaws. If you’d rather have a more systematic point-based system, someone put together a conversion of most of the GURPS Magic spell list using the alternate Ritual Path Magic system. There’s also a much more DnD-feeling Incantation Magic. That comes with a set of example spells (three dozen or so) but is mostly a toolkit to make more, using the powers-based framework of RPM, which is explicitly what Brandon does NOT want. So his best bet is probably standard GURPS magic, which will hopefully be more satisfactory in terms of rationalizing spells that have seemingly been kicking around since Melee/Wizard and The Fantasy Trip in basic concept and stats. Where does GURPS fall short? While GURPS has a lot of merit in terms of what Brandon was looking for, there are some places where it is going to very much clash with what he wants. Skills. Lots of skills. That’s the biggest one. Something like 300 of them, which is a far cry from a dozen or two that he was asking for. In order to get what he wants, someone would need to take the skills list (which you can download at the Trait Sorter) and group them into groups of 3-5 skills, which could serve as limited wildcards, and then take those and cluster them again into groups of 3, which would be legitimate Wildcard! skills containing 9-15 related skills each, and cover all the breadth that GURPS does. Without drowning you. And small enough to list the 25 remaining skills on one page of a standard character sheet. You can also just go buy the Wildcards! skill book, too. Modifiers in Play. There are ways to make this less, as noted with Action. But there are a large number of skill modifiers that can be brought to bear in any given situation. The key, mostly, is to not do that if you want fast and light play. Use Range Bands and BAD (Again, see Action 2) and then just stop. Don’t get persnickety – at least right away – about hit location and a bunch of other stuff. Build-a-Bear. The Ritual Path Magic and Powers systems are the most flexible and deep tools in the GURPS utility belt. To me, they’re also the most annoying. While the power-enhancement-limitation fr amework is almost infinitely malleable, it’s also almost infinitely malleable. The ferocious and long discussions that come up every single playtest, behind the scenes, on how to build a particular power show repeatedly that there are multiple ways to build any one thing. The division between Greater Effects and Lesser Effects was so opaque to me that I suggested ditching them entirely during the writing of DF19: Incantation Magic (that suggestion was accepted, and got me playtest credit). But make no mistake: this path way is very much exactly what Brandon doesn’t want, and for others who are like-minded, this particular subsystem will make you throw the books across the room. My character “The Commander” in Aeon was deeply dependent on these kinds of power builds, and was one of the reasons why he didn’t break out his powers much, preferring to shoot things, stab things, and go all Batman and disappear from plain sight like a Zephyr. Well, not quite that crazy. The sticking point will be the skills list, and hitting the Wildcards! concept hard will help that. You might need to do a bit of Build-a-Bear to get concepts just right, but Wildcards are a great innovation to what otherwise can be a very long character sheet. Hitting up the Dungeon Fantasy RPG when it comes out, or just the DF series presently will go most of the way towards “out of the box” play. And having Banestorm available as a pre-worked campaign setting that is exactly what he was contemplating doesn’t hurt either. I hope he gives it a try. Yrth uses the GURPS Magic system so there isn’t any need to worry about fiddly flexible magic systems (although there maybe is some need to worry about interpretating and balancing spells). I think the biggest place GURPS misses his criteria is Adventure Paths. While there are a few unrelated Adventures (some of them on Yrth), none of them link up. By default, yeah – Yrth uses the regular magic system. I was thinking more of approaching it from a “here’s a setting!” and then he can pull in the spell system he wants. Of course, he wants spells as “pick from a list,” and combat powers too . . . which strongly recommends the GURPS magic system, culled of troublesome spells with the help of knowledgeable friends, as-is. The DFRPG will likely take a long step that direction, thanks to rather a lot of feedback over the years given to Sean about troublesome spells, plus his own fine instincts. 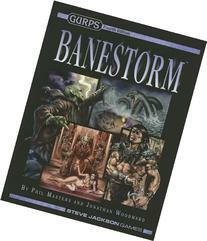 GURPS Banestorm as written meets all of his criteria, except for the adventure paths. Four attributes, GURPS skill resolution, stats for some critters, GURPS Magic spells, and all available abilities are preworked in the book. Whether it is a suitable setting for DF seems debatable, I don’t think it especially is without some modification either to DF or to Yrth, but other people seem to disagree. I guess it depends on what you want a setting for. Although I am not clear that Brandon wants to run DF-style sword-and-sorcery in the first place. For this use case (GURPS with a reduced skill list), instead of trying to distill 300 skills down, it might be better to just import a list of skills from another game and use those with GURPS mechanics. IMHO, Pathfinder has a good balance for a fantasy adventure skill list – less fussy than D&D 3.5 and not as overly-generalized as D&D 4th ed. Yes, this is a great idea. Something that the game I’ve got in development with David is doing (but not for GURPS). There are good condensed skill lists in many games – Pathfinder/5e, Fate, I think Traveller in some incarnations has just a few. Take the ones that make sense for your game, price ’em as wildcards at 12 per level or x3 cost, and move on. The pricing is important because of the value of default use or +1 against the bell curve, and that GURPS is designed around micro-skills. But beyond that, it’s a great design concept.